Community HealthCare System of northeast Kansas is walking the talk when it comes to improving the health of the communities it serves. In recognition of the system’s investments in providing and promoting healthier nutritional options, as well as serving as a role model for healthy lifestyle choices, the Kansas Hospital Association presented one of two 2018 Healthy Kansas Hospitals Centers of Excellence Awards to Community HealthCare System. 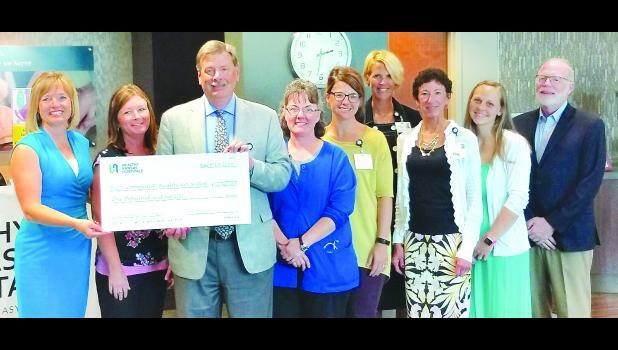 The award and a monetary contribution to help support the hospital’s innovative healthy living programs were presented during a special recognition ceremony on June 19. Since joining the Healthy Kansas Hospitals initiative in 2016, Community HealthCare System has broadened its wellness focus beyond fitness and weight loss programs to include healthy nutrition options in hospital food, alternatives to soda and sugary beverages and healthier snack options in hospital vending machines, and access to fresh herbs and vegetables for hospital patients/visitors/staff and community members. Supporting a community-based farmers’ market, offering tastings of pizzas with cauliflower or whole wheat crusts at a community health fair, and sharing recipes for healthier versions of foods, such as lasagna and brownies, have engaged the community in improving nutritional choices. In 2017, the hospital expanded its community partnerships, working with the Kansas Association for Conservation & Environmental Education to create herb and vegetable gardens at the Onaga campus, where the hospital uses the produce in associate and visitor meals. The system also helped introduce the community to Greens and Gills Greenhouse, a Havensville start-up business growing microgreens via aquaponics. The hospital hosted a public tasting, and uses the produce in its kitchen and provides a venue for sales to hospital associates. System leaders are active members of the LiveWell Committee, and participate in fitness activities – like fun runs – and the L.E.A.N. (Lifestyle, Exercise and Nutrition) weight-loss program.